Author and Reporter: Ritu Saxena, Ph.D. Blood vessels arise from endothelial precursors that are thin, flat cells lining the inside of blood vessels forming a monolayer throughout the circulatory system. ECs are defined by specific cell surface markers including CD31, CD34, CD105, VE-cadherin, vascular endothelial growth factor receptor 1 [VEGFR-1], VEGFR-2, Tie-1, Tie-2) that characterize their phenotype. Angiogenesis is the growth of new blood vessels from preexisting ones and is required for growth and repair. Malignancy is a pathological scenario that requires angiogenesis. The definite cellular origin of adult blood vessel-forming cells necessary for neoangiogenesis has been unknown. Weissman and fellow coworkers in their previous work indicated that the address of these cells might be local, residing in non-circulating tissue. Also, very low numbers of cells with endothelial characteristics and high proliferative potential have been reported in umbilical cord blood or in peripheral blood. The function of circulating endothelial progenitor cells and pharmacotherapy targeted at the endogenous augmentation of these cells for their use in cardiovascular repair has been discussed in detail in a post authored by Aviva Lev-Ari on August 28, 2012. Scientists at the University of Helsinki, Finland, wanted to find out if there exists a rare vascular endothelial stem cell (VESC) population that is capable of producing very high numbers of endothelial daughter cells, and can lead to neovascular growth in adults. They were not only able to define the characteristic cells responsible for giving rise of blood vessels in adults, but took a leap forward by generating blood vessels from a single cells from the VESC population. (Figure: VESCs discovered that reside at the blood vessel wall endothelium. These are a small population of CD117+ ECs capable of self-renewal. Image Courtesy: Fang et al, 2012). 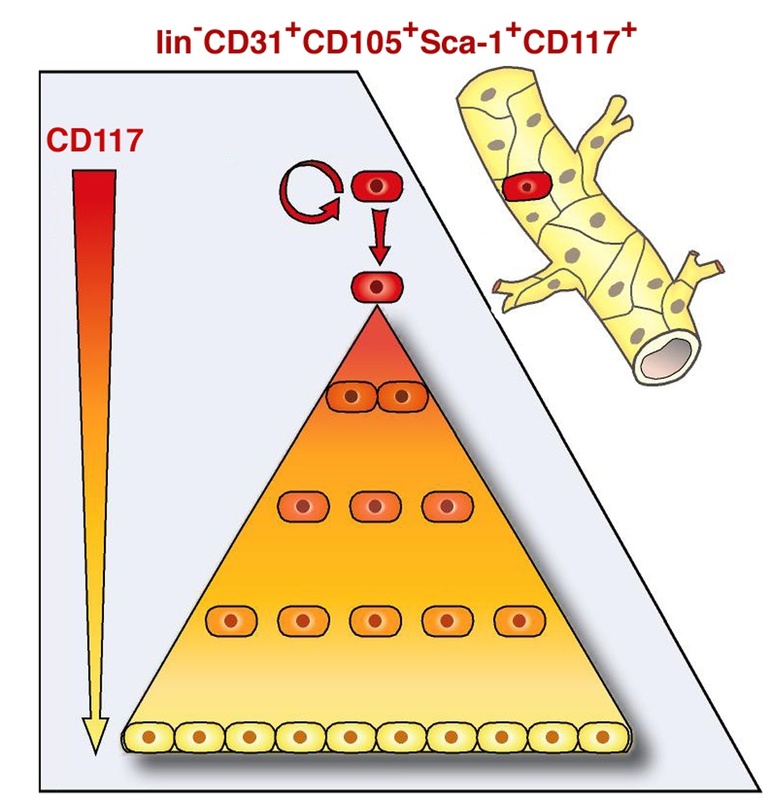 The VESCs, as explained by the Fang and coworkers, reside in the blood vessel wall endothelium and constitute a small subpopulation within CD117+ (c-kit+) endothelial cells (ECs). These cells are capable of undergoing clonal expansion unlike the surrounding ECs that bear limited proliferating potential. VESC discovered in this study were found to a have a certain characteristic phenotype defined by the presence of a few surface proteins. The authors utilized the technique of FACS (Fluorescence Activated Cell Sorting) to isolate the cells capable of undergoing clonal expansion. The sorting was performed against endothelial-specific protein markers CD31 and CD15, and against CD117 and Sca-1 molecules that are expressed by many adult stem cell types including hematopoietic stem cells (HSCs) and prostate and mammary gland stem cells. The experimental results defined the surface characteristics or the phenotype of the isolated cells to be lin2CD31+CD105+Sca1+CD117+A. A single VESC cell isolated from the endothelial population was able to generate functional blood vessels that connected to host circulation after transplantation in mouse. In cell culture, these cells were shown to generate tens of millions of daughter endothelial cells. Also, within cell culture, the isolated VESCs showed long-term self-renewal properties, bearing similarity to adult stem cells. The self-renewal capacity of VESCs was evident even in vivo, when the ‘isolated’ ECs containing VESCs retained the capacity to generate functional blood vessels during serial transplantations. The transplanted ECs were monitored with the help of Green Fluorescent protein (GFP). Fluorescent blood vessels were observed in secondary, tertiary, and quaternary transplants providing direct evidence that the GFP-tagged ECs contained VESCs with self-renewal capacity. Furthermore, the cell culture and animal experiment results were supported by the observation that abundant CD117+ ECs were discovered in human malignant melanomas and invasive breast cancer samples. Cell-based therapies: VESCs could be used in cell-based therapies for cardiovascular repair to restore tissue vascularization i.e., the daughter cells arising from VESCs at the target site could assist in repair by generation of neoangiogenic ECs required for the formation of blood vessels. Therapeutic target: VESCs could serve as a possible cellular and molecular target to restrain angiogenesis by inhibiting endothelial-cell proliferation thereby blocking cancer progression. A possible light by Stem cell therapy in painful dark of Osteoarthritis” – Kartogenin, a small molecule, differentiates stem cells to chondrocyte, healthy cartilage cells Author and Reporter: Anamika Sarkar, Ph.D and Ritu Saxena, Ph.D. Stem cells for the rescue of mitochondrial dysfunction in Parkinson’s disease Reporter: Ritu Saxena, Ph.D.
Harris DT, Badowski M, Nafees A, Gaballa MA. The potential of Cord Blood Stem Cells for Use in Regenerative Medicine. Expert Opinion in Biological Therapy 2007. Sept 7(9): 1131-22. Furfaro E, Gaballa MA. Do adult stem cells ameliorate the damaged myocardium?. Human cord blood as a potential source of stem cells. Current Vascular Pharmacology 2007, 5; 27-44. Thank you for all the additions to the post.